Avengers: Infinity War finally revealed the Marvel Cinematic Universe's biggest mystery MacGuffin, the Soul Stone, but it admittedly wasn't all that fulfilling of a reveal. After all the work it took to locate and obtain it, the Soul Stone didn't actually do much in the context of Avengers: Infinity War's story, but there was one instance Thanos employed the Soul Stone's power — and most fans probably missed it! "McFeely: Joe and Anthony had a peculiar obsession with "The Raven." Joe: I did. I loved "The Raven" growing up. And I wanted to see a scene in this movie where Thanos' full powers went against Doctor Strange's full powers... And this is one of the only uses of the Soul Stone in the film. Anthony: Until it's final use." The exact scene in question is when Doctor Strange makes multiple copies of himself to distract Thanos, and attempts to snare the Mad Titan in a net of energy bands. Thanos blasts the copies away using the Power Stone, but manages to identify the real Strange by using the Soul Stone to knock The Sorcerer Supreme's Astral Form loose. That causes Strange to have to literally and spiritually pull it together. In the heat of the battle, most fans probably weren't keeping close eye on which Infinity Stones were lighting up as Thanos took Strange apart, so this is a nice bit of insight from the creative team. Other commentary reveals that there was a method to Thanos' madness when it comes to the Infinity Stones. 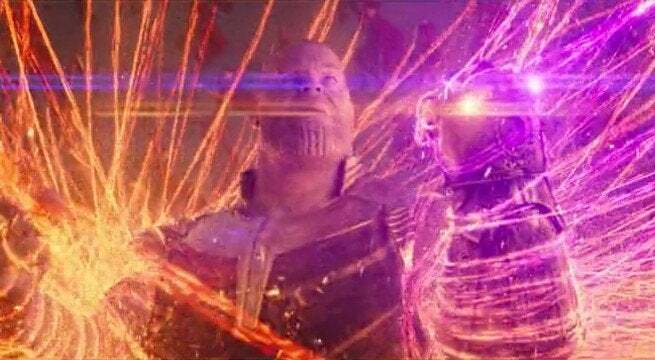 Whenever the Mad Titan obtained a new stone, the Russo brothers made sure he used it in the next sequence he appeared in. And so, after discovering the Soul Stone on Vormir, Thanos made the hop over to Titan and got to try out the stone firsthand. As indicated in the commentary, this was the only individual use of the Soul Stone in the film. The other time the stone was employed was when Thanos used the combined power of all the Infinity Stones for his infamous "snap" that wiped out half of all life in the universe. Avengers: Infinity War is now available on digital platforms and lands on DVD and Blu-ray on Tuesday, Aug. 14. Ant-Man and the Wasp is now in theaters. Did you notice the Soul Stone's power at work in this scene of Avengers: Infinity War? Let us know in the comments!